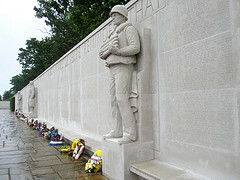 Opened in 1956, the Cambridge American Cemetery and Memorial commemorates those American servicemen who died in WWII. Set between the villages of Madingley and Coton, the cemetery contains the remains of 3,812 servicemen. For those whose bodies were never recovered, the Wall of the Missing is inscribed with over 5,000 names and four statues of servicemen reside on the same spot. The memorial building itself is a large 85ft long structure made of Portland stone and comprises a Museum and separate small Chapel. The artwork in the Museum is highly evocative as one wall is covered by a huge map, which shows the routes and actions taken during the War. On the adjacent walls and ceiling are painted angels and aircraft against heavenly blue backdrop. The reason for aircraft taking a prominent position in the artwork is to draw attention to the many servicemen who lost their lives during the strategic air bombardment of North West Europe. This is not to detract from the colossal loss of American lives during the Battle of the Atlantic, to which the memorial is largely dedicated. The Chapel offers visitors a quiet space in which to reflect on the sacrifices made by American servicemen in the War and is a lovely place in which to pay respects. The Cemetery is set out in a wide sweeping curve, noticed in full from the standpoint of the main entrance flagpole platform. It is popular with visitors as an inviting area to wander through thoughtfully and is a really nice way for children to learn more about WWII. Opening Times: 9am-5pm. Closed Christmas Day and 1st January.